In this post I cover how to check the size of a subject from a photo taken at or above life size (i.e. 1:1 or higher) magnification. This information can be useful when trying to obtain an ID for an insect / flower you've photographed. For subjects taken at less than life size magnification, they should hopefully be large enough for you to get a good estimate of the size by eye. Carrying round a notepad and pen with you may be useful to record the size. If you are using Canon's MP-E 65mm/2.8 Macro Photo lens, this lens records the magnification data in the EXIF maker notes. For other lenses you need to either record the magnification the photo was taken at, or make sure you take a reference photo at a specific magnification. When calculating the size of your subject from the image, the first thing you need to do is to get the sensor size of your camera. Google is handy here. For my 450D, the sensor width is 22.2mm. 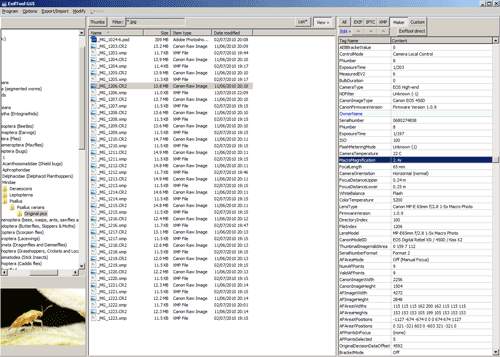 Download Exiftool, or if you're on Windows you can use ExiftoolGUI. In ExiftoolGUI browse to your image, select it, then in the Maker tab look for 'MacroMagnification' value. Or in ExiftoolGUI you can otherwise click the Exiftool direct button and then type -MacroMagnification in the pop-up box, and press enter to see the value. Your Image processing software may not save the maker notes into JPEGs (e.g. 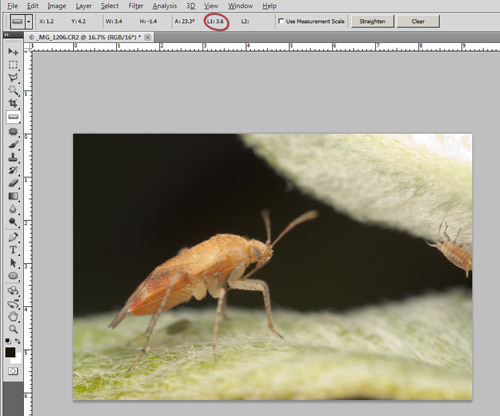 Adobe Camera Raw doesn't), so you have to check the MacroMagnification on the original CR2 file rather than a JPEG you have processed from the CR2. Divide the sensor size of your camera by the Magnification, e.g. my 450D's sensor size is 22.2mm, and Magnifcation for my image was 2.4x, so 22.2/2.4 = 9.25. This is the width of your image. 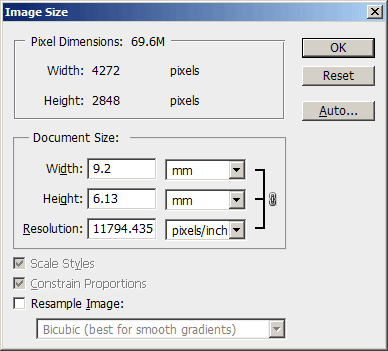 Now you can use the ruler tool in Photoshop to measure the size of your subject. I can see my bug is 3.6mm long. Hello David, thanks for providing this helpful information. Would you expect the MacroMagnification data to be recorded in RAW files created with a Sony A7R, which is connected to the Canon MP-E 65 via the Metabones EF to E IV adapter? I suspect that some of the metadata is omitted, because although ExiftoolGUI reveals LensType : Canon MP-E 65mm f/2.8 1-5x Macro Photo + Metabones Adapter and lots of other stuff, the magnification figure isn’t revealed. I think the MacroMagnification is a Canon specific metadata property, so it would only be recorded by Canon cameras. For other cameras you’d need to try and remember to write down the magnification for each shot, or take a photo of a ruler each time you change the magnification. I appreciate that this is an old blog. However I have a question about this. I.e it is not a square, therefore as your bug is not parallel to the bottom line should not the calculations take this into account? The ruler tool measures the length of the line you draw with it, it doesn’t measure only along the horizontal axis (unless you draw a horizontal line with it). So you can use the line length given by the ruler tool, no need for trigonometry!